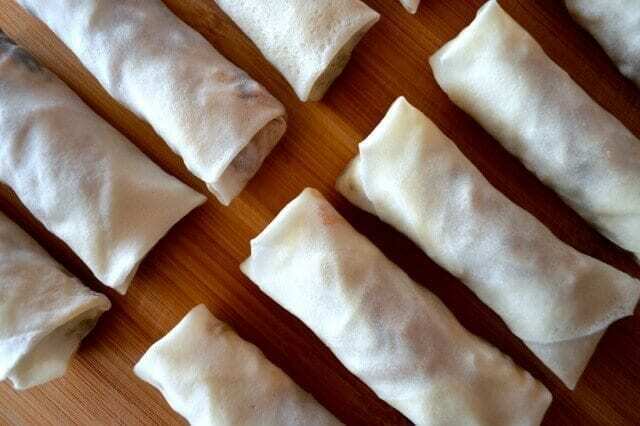 Before immigrating to the US when I was sixteen, this was the only spring roll recipe I knew. It’s not to say that other versions didn’t exist, it’s just that I didn’t come face to face with them. Traveling wasn’t exactly in vogue then. Worrying about putting enough food on the table and buying some new clothes for the family at Chinese New Year was what everyone strived for at the time, so there was no extra cash to do anything else. I grew up in Shanghai and remember clearly that these little babies only appeared during Chinese New Year celebrations. And they’re really good. 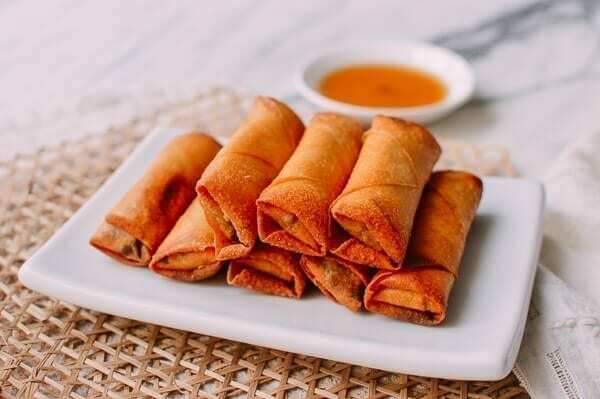 You get a lot of flavor from a small bit of meat and shiitake mushrooms, so this recipe produces healthier, lighter spring rolls than some of the Shanghai Style spring rolls recipes out there, which we love. 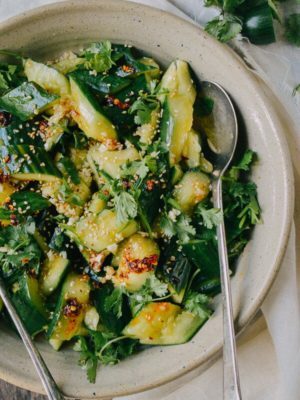 If I haven’t grossed you out yet, trust me when I say that this is a great recipe. These spring rolls bring me back to Shanghai and some of the better memories of my childhood. 6-8 thinly sliced shiitake mushrooms (Soak them for a couple hours in water until they’re soft. 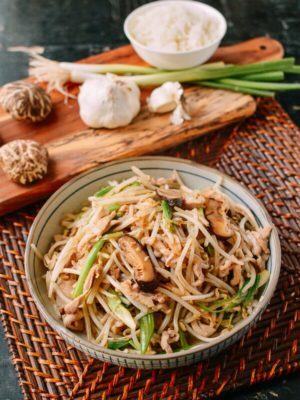 Fresh mushrooms don’t have as much flavor as dried, so try to find the dry ones at an Asian grocery near you. Mix the pork with the marinade ingredients and let sit for 20-30 minutes. 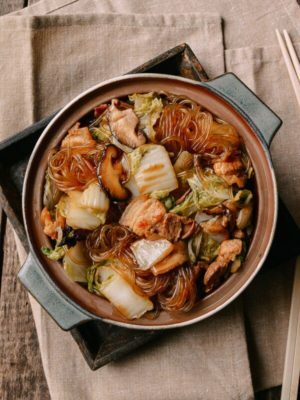 Shred the cabbage and slice your mushrooms. 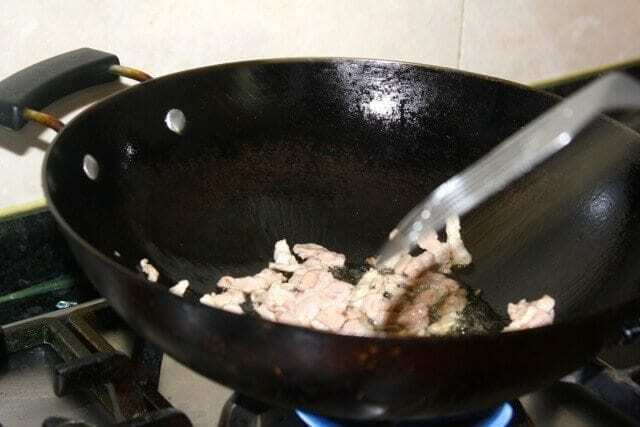 Over medium heat, add 4 tablespoons of oil to your wok. Brown the pork. Then add the mushrooms and cook for another couple of minutes until fragrant. Add the napa cabbage and stir well. Season with salt, white pepper, shaoxing wine, and soy sauce. 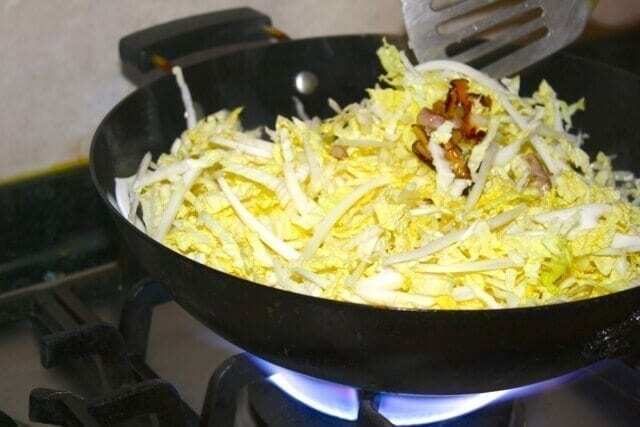 Stir everything together, cover the lid and let it cook over high heat for 2 – 3 minutes, or until the cabbage is wilted. 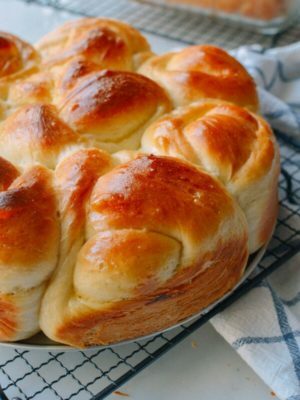 Uncover the lid and add the cornstarch slurry. Stir. The mixture will start to thicken. You don’t want there to be extra liquid in the mixture, so add more of the cornstarch/water mixture if need be. Lastly, add sesame oil and stir everything thoroughly. Turn off the heat and let the mixture cool completely. And place the wrapper in front of you so that a corner is facing toward you. 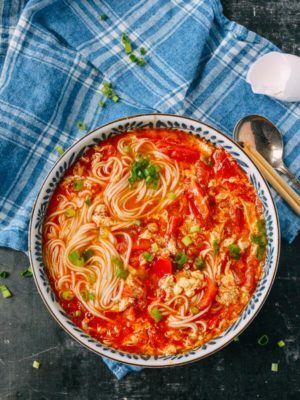 Use about one and a half tablespoons of the mixture per spring roll, spoon it about an inch and a half from the corner closest to you. …and like you’re making a burrito, fold over both sides. Continue rolling it into a cigar shape. With your fingers, brush a bit of water to the closing corner of the wrap to seal it. Place each roll seam-side down on a tray. This recipe makes about 25 spring rolls (you can also prepare them ahead of time and freeze them). 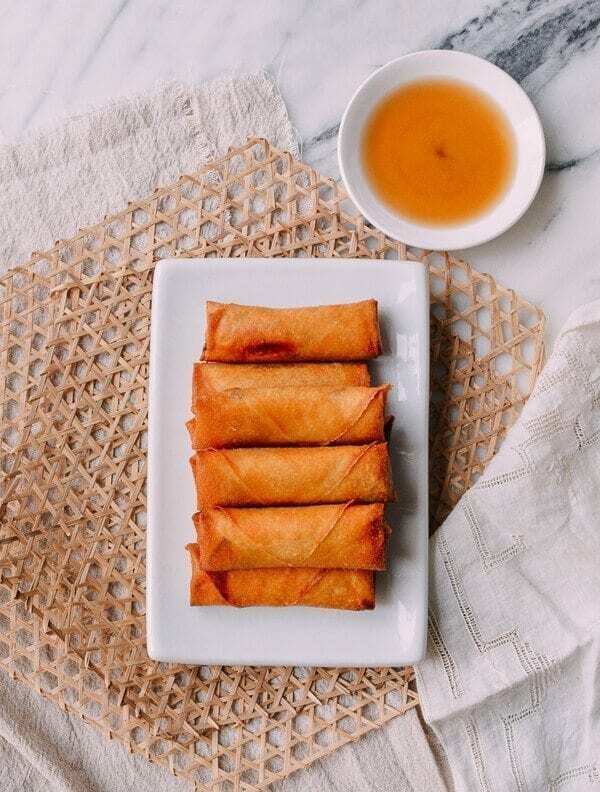 To fry the spring rolls, use a small pot or shallow pan (which requires less oil) and fill it with oil until it’s about 1-inch deep, just enough to submerge the spring rolls when frying. Heat oil slowly over medium heat. To tell if the oil is ready, I just dip a bamboo chopstick into the hot oil, and if some bubbles form around the chopstick, then the oil is ready. Slowly add the spring rolls and fry them in small batches. Cook each side until golden brown and drain on a plate lined with a paper towel. We like to serve our Shanghai Style Spring rolls with some Chinese black vinegar or a lighter Shanghai red vinegar for dipping! 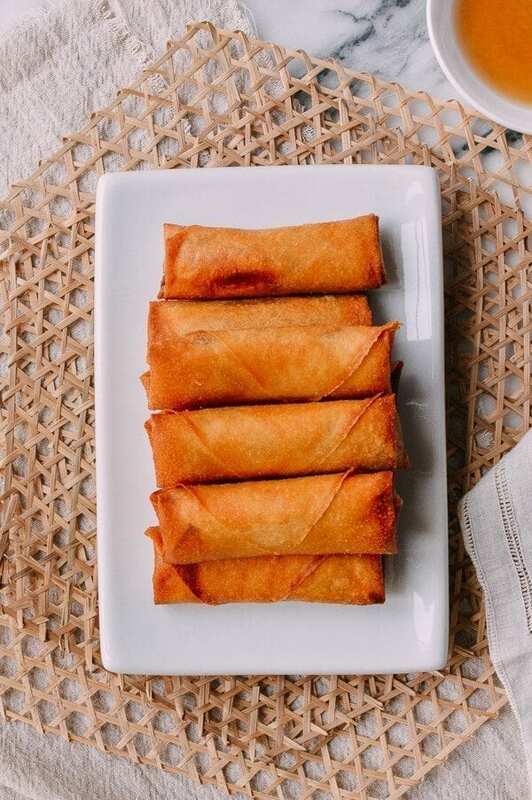 If you prefer the spring rolls you usually see at the dim sum restaurant, then check out our homemade Cantonese spring roll recipe. Note: fry the spring rolls immediately after assembling. You don’t want them to sit out for a long time, because the wrappers can become soggy from the moist filling. If you want to make them ahead of time, freeze them on a tray and then transfer to a freezer bag once they’ve hardened. You can fry them right after taking them out of the freezer…no need to thaw them. 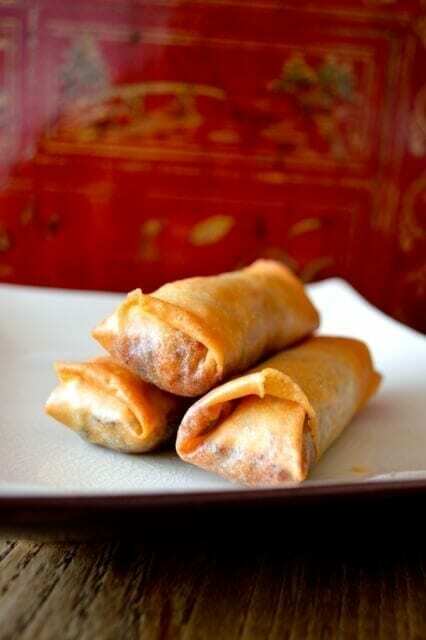 Shanghai Style Spring rolls always appear in the kitchen during Chinese New Year celebrations. 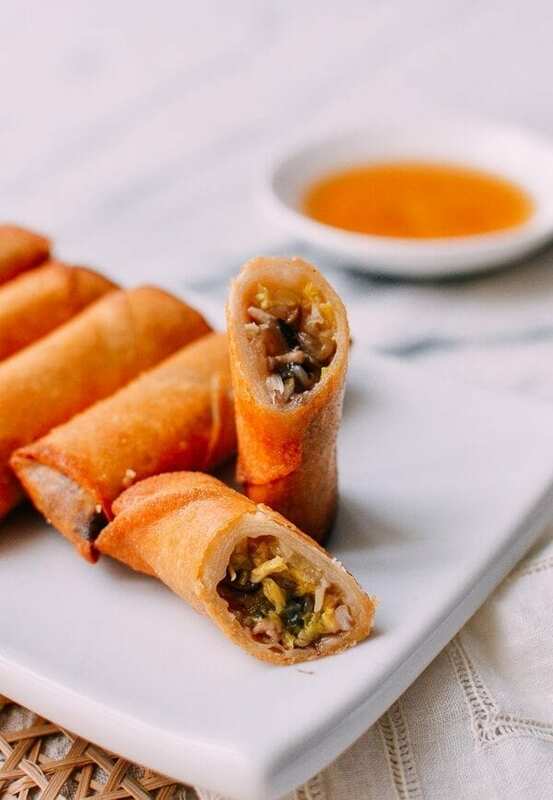 These spring rolls pack a lot of flavor from a small bit of meat and shiitake mushrooms, so this recipe produces healthier, lighter Shanghai Style spring rolls than most recipes out there. 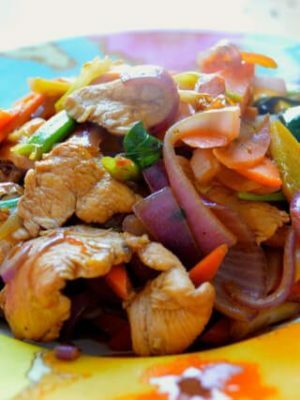 Over medium heat, add 4 tablespoons of oil to your wok. Brown the pork. 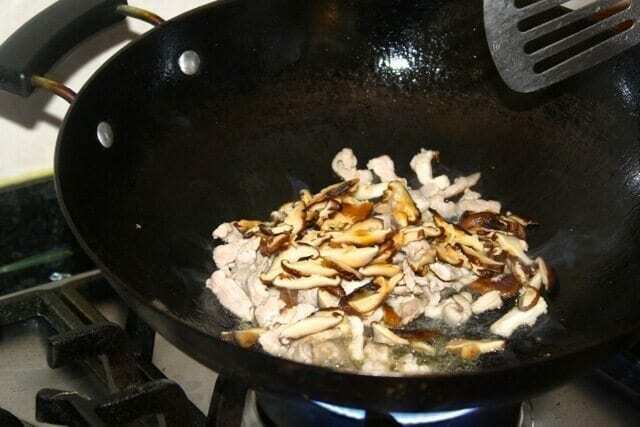 Then add the mushrooms and cook for another couple of minutes until fragrant. Add the napa cabbage and stir well. 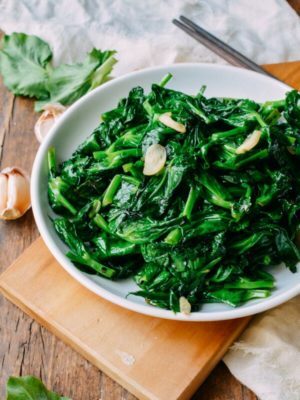 Season with salt, white pepper, shaoxing wine, and soy sauce. 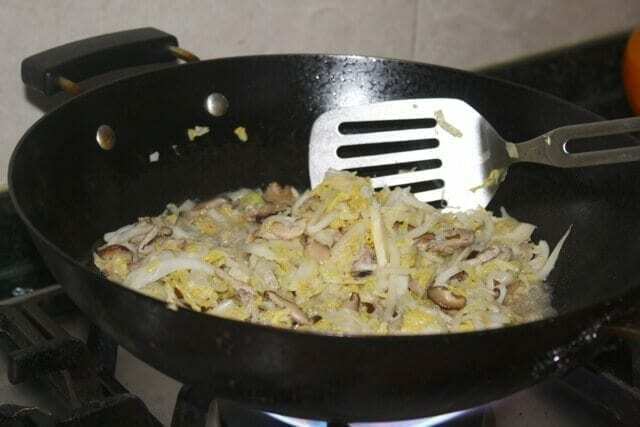 Stir everything together, cover the lid and let it cook over high heat for 2 - 3 minutes, or until the cabbage is wilted. The key to wrapping spring rolls is making sure that they’re really tight and not overstuffed. Place the wrapper in front of you so that a corner is facing toward you. 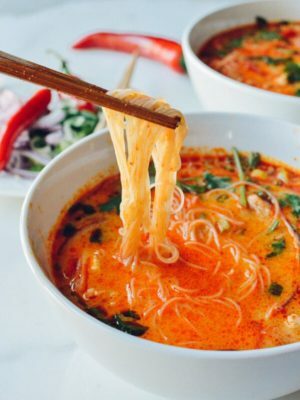 Use about one and a half tablespoons of the mixture per spring roll, spoon it about an inch and a half from the corner closest to you. Roll it over once, and like you’re making a burrito, fold over both sides. Continue rolling it into a cigar shape. With your fingers, brush a bit of water to the closing corner of the wrap to seal it. Place each roll on a tray seam-side down. This recipe makes about 25 spring rolls (you can also prepare them ahead of time and freeze them). 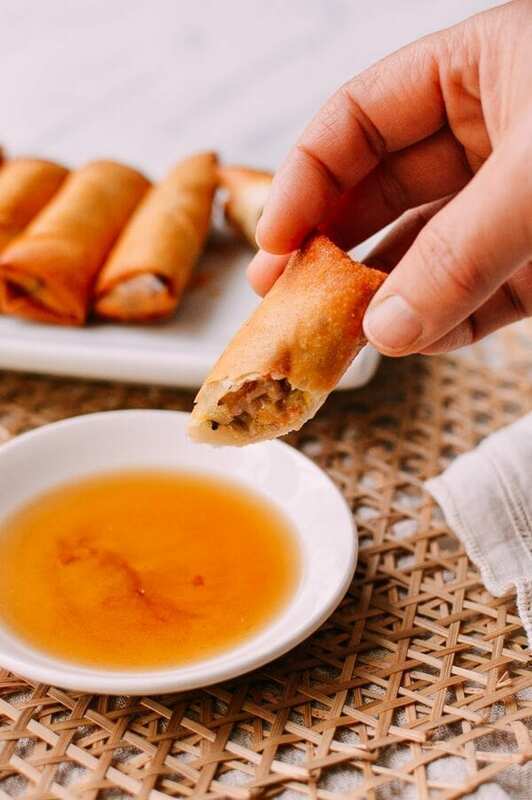 To fry the spring rolls, use a small pot or shallow pan (which requires less oil) and fill it with oil until it’s about 1-inch deep, just enough to submerge the spring rolls when frying. Heat oil slowly over medium heat. To tell if the oil is ready, I just dip a bamboo chopstick into the hot oil, and if some bubbles form around the chopstick, then the oil is ready. Slowly add the spring rolls one at a time, and fry them in small batches. Cook each side until golden brown and drain on a paper towel. We like to serve them with some Chinese black vinegar for dipping! Fry the spring rolls immediately after assembling. 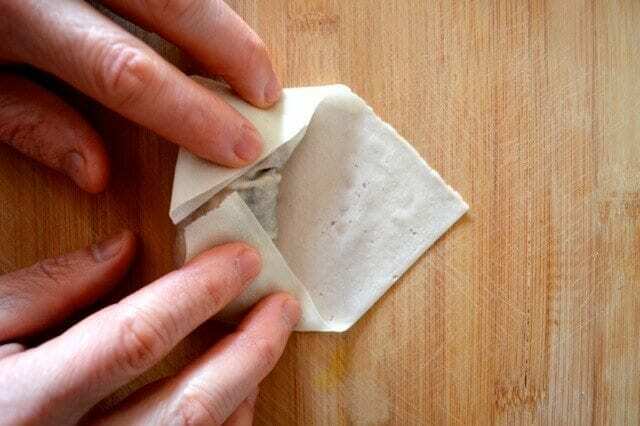 You don’t want them to sit out for a long time, because the wrappers can become soggy from the moist filling. 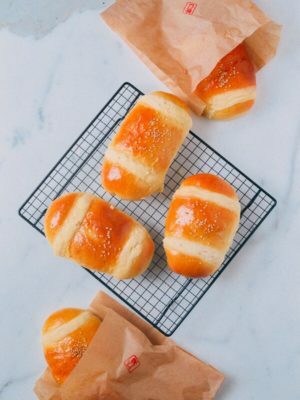 If you want to make them ahead of time, freeze them on a tray and then transfer to a freezer bag once they’ve hardened. You can fry them right after taking them out of the freezer…no need to thaw them. What’s the best to substitute the wine? Hi Yan, I think the best substitute for Shaoxing wine is dry sherry. Where can i buy spring roll wrappers ? Hi Joan, you can find the spring rolls at any well stocked Asian supermarket. 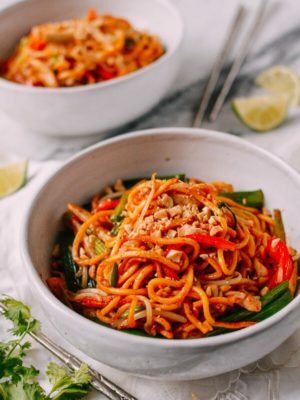 We have a picture on our Noodles and Wrappers page but there are many brands! Hi Joan, most Asian supermarkets will have it in their refrigerated section. 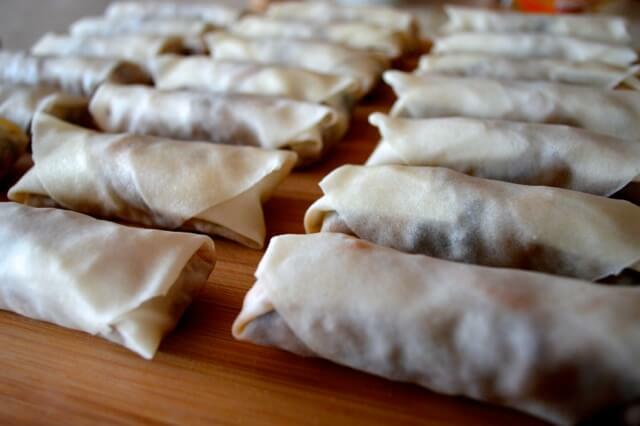 I make my own spring roll wrappers as I am nowhere near an Asian supermarket. It is easy, just flour and water and a couple of eggs, and a rolling pin. I usually make 2 dozen and put them in the freezer. Come Saturday myself and my wife will be having spring rolls for supper. Yum Yum. 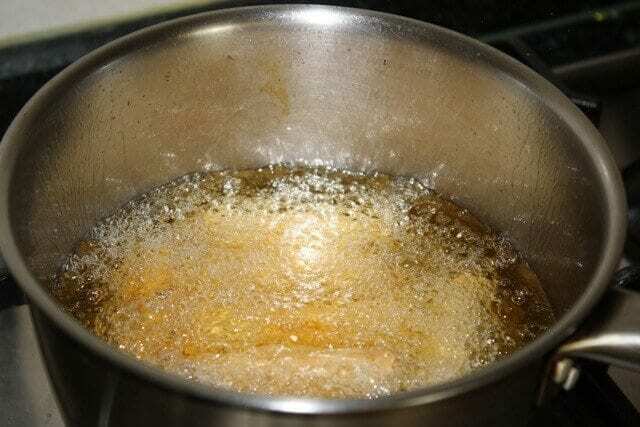 When frying up a frozen batch, what is the ideal oil temperature? Does it take longer? Hi Miguel, I usually go by feel. Test the oil temperature by dipping the egg roll in the heated oil. There should be a lot of big bubbles around the egg roll, but the oil should not be smoking. Remember to set the heat level at medium and fry until they are golden brown. I remember I used to love watching people making spring roll wrappers on the street when I was little. It was quite an art I thought. Do you by any chance know how to make the wrappers? Hi Lu, thanks for comment and great question! We don’t actually have a recipe for the wrappers, but it would be an interesting thing to look into! 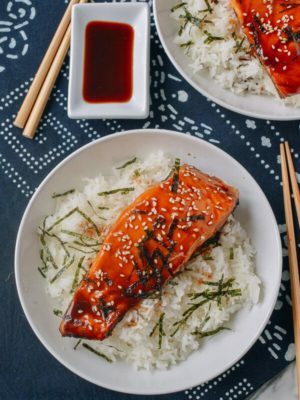 I just wanted to make a couple suggestions on this recipe. these eggrolls so much better. Hi Arman, thank you so much for your suggestions. We will have to give these suggestions a try. 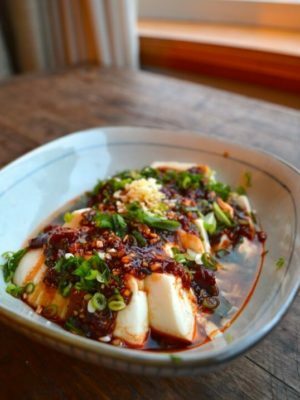 love looking at your recipies Would like to start with eggrolls or noodle dish I love to cook but haven’t done that much asian style. 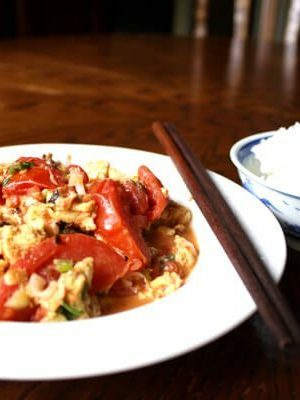 Hi Joanie, Chinese cooking is actually not that hard; it’s a good idea to start with fried rice dishes and stir-fry dishes. Just let us know if you have any questions. Happy wokking! 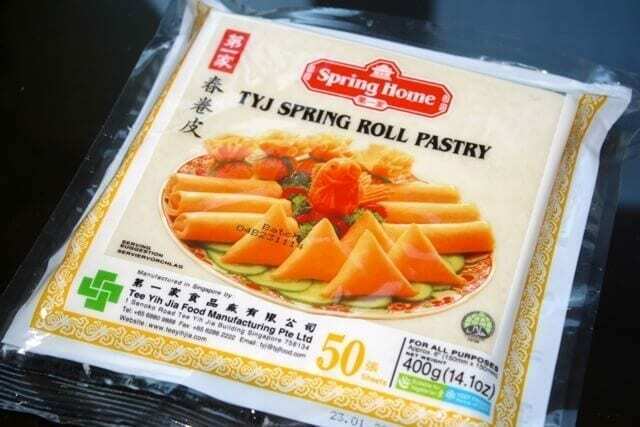 Hi..When I make spring rolls using store brought wrappers, the outside wrapper bubbles up and its not as smooth as in your pic or as we get it in restaurants..Any idea why the wrapper bubbles up? Hi Dhivya, two things could be going wrong. 1. the wrappers themselves might be too wet. If there’s a lot of moisture, it reacts with the oil and causes bubbles. Make sure your filling isn’t too wet (it can be wet, but there shouldn’t be too much excess moisture dripping off of it when you lift it with a spoon), and be careful not to use too much water (as the “glue”) when assembling them. Also, make sure that they’re wrapped really tightly without any air pockets! 2. It could also be that the oil is too hot–this is a more common problem. It shouldn’t be bubbling too violently when you put the spring rolls in to fry. It should be around 350 degrees. 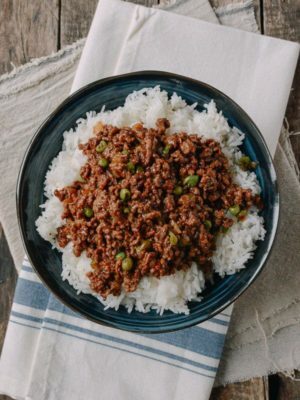 You can use the trick we mentioned in the recipe. 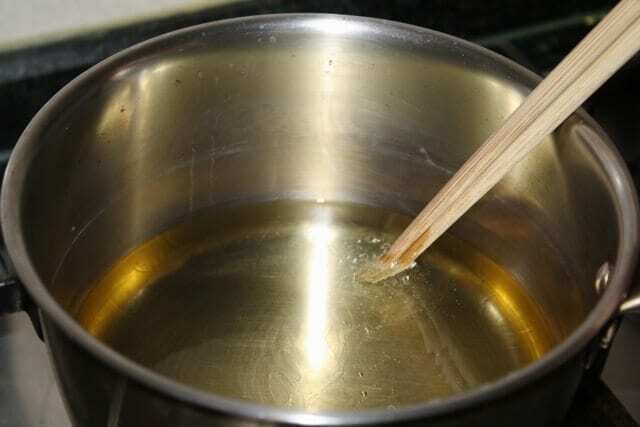 Dip a wooden chopstick into the oil; once the oil starts to bubble around the chopsticks, the oil is ready! Just make sure to fry them in small batches, so the oil temperature doesn’t go down too much. Another reason might be that you are buying “egg roll” wrappers vs spring roll wrappers. These are thicker than what I call Shanghai style wrappers. 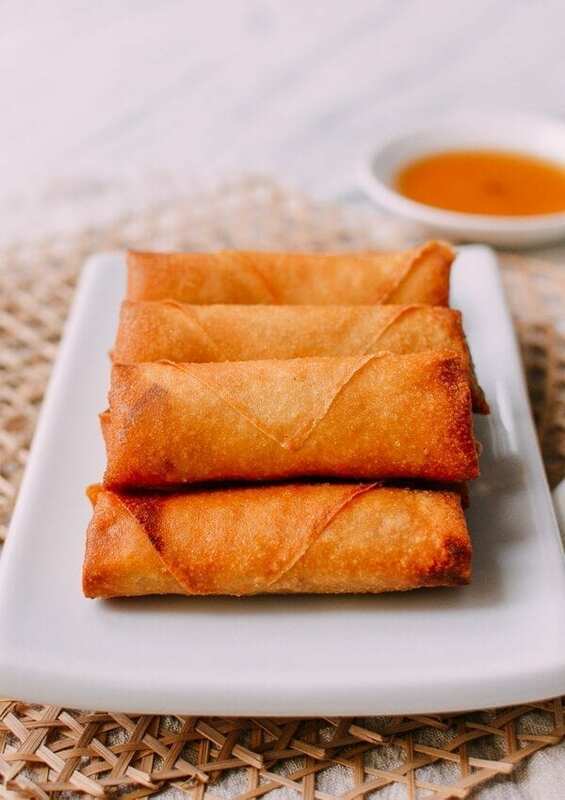 The egg roll type are often what you find at a regular grocery store and at American Chinese takeout places. Funnily enough egg rolls in Chinese actually are made with egg so not sure how the term egg rolls came to mean spring rolls on English menus.